We’ve used this Snooker Betting System to make consistent profits betting on Live Snooker Frames since 2009 (updated in 2018)! This system will show you how to bet on Live Snooker Frames and make a profit no matter which player actually wins the frame. When you can bet on BOTH players, you can guarantee a win! NO EXPERIENCE NECESSARY – We show you the exact process and method on how to select profitable matches, and how to place a strategic bet during certain frames to try and GUARANTEE a profit regardless of who wins. FULL USER MANUAL & VIDEO INSTRUCTION – Everything you need to learn is explained in our Video for easy viewing. There is a full User Manual and Betting Chart included with this system (updated in 2018). We IDENTIFY the particular frames that should produce a profit. Then we place an initial bet, and WATCH the start of the frame. Depending on how the frame unfolds will determine our next bet. This next bet is an IN-PLAY bet (or ‘in-frame’ bet) – it means we must be able to place a bet DURING a frame (both Betfair and Bet365 usually offer this). Then we sit back and let the frame finish and collect our winnings in most cases. During a big event like the Masters, World Championship, Welsh Open or UK Championship, in a single day there could be over 5 frames per hour to choose from and bet on, meaning plenty of opportunities. It’s not uncommon to make £200+ profit each day during these big tournaments, and that’s starting with a bankroll of just £200! WE SHOW YOU HOW TO PROFIT NO MATTER WHICH PLAYER WINS – JUST WATCH US DO IT AND COPY US! THIS SYSTEM ALLOWS YOU TO BET ON BOTH PLAYERS IN A SNOOKER FRAME AND PROFIT NO MATTER WHICH PLAYER WINS. IT WORKS BECAUSE MOST FRAMES START IN A CERTAIN WAY AND OUR SYSTEM SHOWS YOU HOW MUCH, WHEN, AND WHY TO BET (AND WHICH PLAYER TO BET ON). AS EACH FRAME UNFOLDS, IF IT TAKES A VERY COMMON ROUTE, YOU CAN PROFIT NO MATTER WHO WINS! IF THIS ROUTE ISN’T FOLLOWED, ANY POTENTIAL LOSS IS SLASHED & MINIMISED. THIS MAKES THE SYSTEM VERY PROFITABLE. Snooker is now played ALL YEAR ROUND. Almost every other week there is an event somewhere going on. A few years ago there was only around SIX tournaments a year you could really bet on. Now there are over 20 events each year. Every month there is a least one event that you can bet on, and most are streamed live online, and many are live on Eurosport, BBC, ITV or SKY SPORTS or free to view online from the betting sites live streaming service. In order for you to get the most from using this system, It would be wise to have at least £200 GBP (or whatever your currency is USD, EUR, AUS…) in your starting bank. With £200 starting bankroll we’d recommend betting between £25 and £50 as your FIRST BET of each frame. As a ratio, this would be between 15% and 25% of your entire bankroll. You could get away with a smaller bankroll (maybe £100), but you’ll win less each frame you win because you’ll be betting with smaller amounts. It depends on how much you bet, how many frames you bet on, and to some degree what happens in each frame! But to avoid any confusion – YOU CAN WIN & PROFIT USING THIS SYSTEM. And i’m not talking about a one-off fluke or a couple of lucky frames here and there. If you’re betting in the region of £50+ each frame during a major event, you could win over £200+ each day EASILY. If you’re betting more like £25 per frame during smaller events, it’s totally possible to win £75-£100 in a day. How much you can win depends on you bankroll, bet amounts and how you bet during the frames. Even though we first released this system back in 2009, the strategy is STILL WORKING today. This Snooker Betting System was improved in 2018. 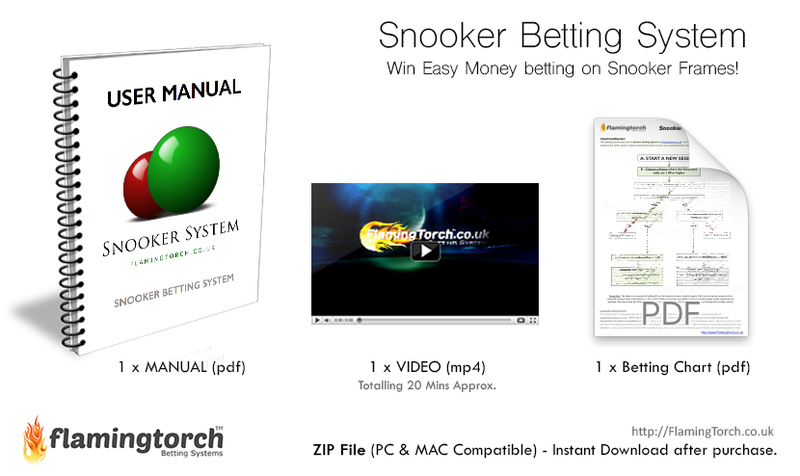 The system now comes complete with a full User Manual, Betting Chart and FAQ Document. The original Video is still included as this demonstrates and explains the system well. We’ve improved the strategy slightly as explained in the Manual and the Betting Chart. The strategy used is solid and can be used ALL YEAR ROUND betting on Snooker Frames during matches/events/tournaments. In our video we are using Betfair.com to place our bets. You DO NOT have to use Betfair. You can use ANY online bookie or sportsbook that offers Snooker Betting, as long as you are able to place a bet IN-PLAY (during the matches). Do I need to know about Snooker? Not really, as long as you know the basics (what a ‘frame’ is, what the ‘cue ball’ is, what the coloured balls are worth) then that should be enough. If you’ve ever watched a Snooker match and understood what’s going on, you will be fine! £200 would be ideal, £100 minimum (100 of your currency). Do I have to BET IN-PLAY (bet during the frames)? Yes. The system works by picking certain frames (based on our criteria) and betting BEFORE they begin. But, you need to be able to place at least one bet DURING the match in order to guarantee a win or minimise a loss. Do I have to WATCH each frame I bet on? Yes. If you cannot watch the frames you bet on, you must AT LEAST be able to keep an eye on the live odds and place a bet during the frame based on the score if certain things happen. So YES watch if you can, or monitor the score/odds on the betting site if not. How many tournaments are there per year? There are currently OVER 20 Snooker events and tournaments played each year, on average about 1 every 2 weeks. There are plenty of opportunities to bet on Snooker these days, all of them are available to bet on. You could bet whatever you like, but we would advise £25 to £50 (per frame). It will NOT be complicated and you will easily understand everything – everything is step by step. There is even a Betting Chart included. You can also Contact Us anytime you need help or have a question. 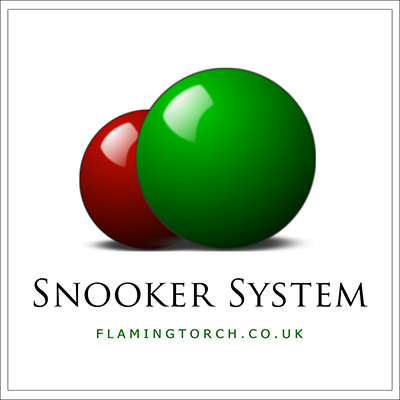 I was searching on google for a snooker betting system and found this one by flamingtorch. I’d never heard of flamingtorch or this system before, and so I watched the videos and read everything I could about the system. There is not much choice when it comes to betting systems for snooker, so I took a chance as this seemed legit and was priced under £100. I did not regret my purchase. This system is very easy to follow and I was betting on snooker the next morning. Let me just say that a full manual is included with this system, and a betting chart to follow (which makes it really easy). I bet on 3 snooker frames and won all of them, making over £70 profit (i used betfair). I can truly say it was easy, I just followed the betting chart really. The video is OK but not really that necessary IMO – the manual and betting chart are all you really need. I would recommend this to anyone looking to bet on snooker. Wow, what an incredible snooker system you’ve made here! Not only am I able to bet on individual frames, but I can bet on both players to win! I have always loved snooker and betting on the players that I follow throughout the year. Thank you so much for this, it’s a superb system! Would of been better if I didn’t have to watch the snooker frames. I have won 3 out of 4 frames i’ve bet on and the only frame I lost was a very long drawn out frame where nobody got a break past 20 points. This ended up as a black ball finish and I lost out. However, I can see the potential for using this long term as most frames would be winners using this system. *edit – this now comes with a full manual* – It could really do with a written manual included because I found myself having to make notes from the video in order to remember what the odds were and when to bet. I understand that everything is explained in the video, but for me a manual would of been a huge help. START MAKING MONEY FROM SNOOKER USING OUR SNOOKER BETTING SYSTEM TODAY! DOWNLOAD IT NOW! Download your copy of our Snooker System today and learn how to make money from Snooker Betting with our easy to follow User Manual and Instructional Video. Click the Add to Cart button below.